Manufacturing sales increased 1.0% to a record $53.9 billion in March, reflecting higher sales in the transportation equipment and food industries. Overall, sales were up in 16 of 21 industries, representing 71% of the Canadian manufacturing sector. Sales of durable goods rose 1.3% to $28.4 billion, while sales of non-durable goods increased 0.7% to $25.4 billion. In constant dollars, manufacturing sales in volume terms rose 0.2%. Sales in the transportation equipment industry rose 2.1% to $11.1 billion in March, following two months of declines. The increase was the result of gains in the motor vehicle (+4.5%) and the motor vehicle parts (+1.8%) industries, reflecting higher volumes and prices. After removing the effect of price changes, sales in volume terms increased 3.1% and 0.5% respectively in these industries in March. In the food industry, sales rose for the second straight month, up 2.6% to a record high $8.9 billion in March. Widespread gains in sales were posted in all nine food industries and reflected higher sales volumes, particularly in the meat, dairy and other food product industries. After removing price effects, sales volumes of the food industry increased 2.2% in March. Sales in current dollars also advanced in the wood (+3.1%) and computer and electronic product (+5.1%) industries. These gains were widespread and reflected higher volumes and prices in both industries. These increases were partially offset by a 1.7% decline in the petroleum and coal product industry to $5.0 billion, mostly reflecting lower prices. After removing the effect of price changes, sales volumes of petroleum and coal products edged down 0.2%. 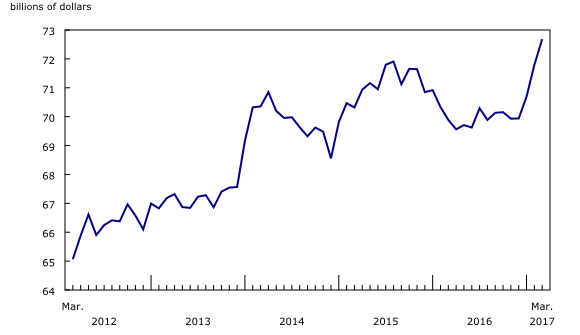 Sales in Ontario increased 1.3% to $25.9 billion in March, largely due to the motor vehicle (+4.1%) and food (+1.8%) industries. These increases were partially offset by lower petroleum and coal product sales (-6.5%). In British Columbia, sales grew 2.9% on a strong increase in wood products (+10.5%). Sales in Alberta rose 1.6% to $5.8 billion, led by gains in food (+3.9%). The largest decrease was in Manitoba, where sales fell 1.9% to $1.5 billion, largely due to chemical sales. In Quebec, sales edged down 0.2% to $12.7 billion, mostly due to lower sales in the transportation equipment and wood products industries. Total inventories increased 1.2% to a record high $72.7 billion in March. This was the fourth consecutive increase in inventories, with 17 of 21 industries posting higher levels. The gains were attributable to the transportation equipment (+3.1%), beverage and tobacco (+9.3%) and machinery (+1.4%) industries. The inventory-to-sales ratio was unchanged at 1.35 in March. The inventory-to-sales ratio measures the time, in months, that would be required to exhaust inventories if sales were to remain at their current level. Unfilled orders rose for the third consecutive month, up 1.8% to $90.2 billion in March. Transportation equipment (+1.3%), machinery (+5.2%), and computer and electronic products (+6.6%) were responsible for the increase in unfilled orders in March. 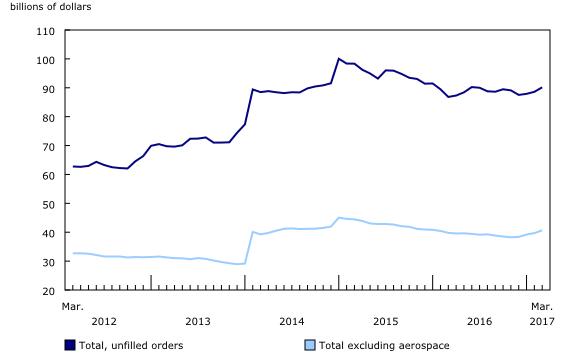 Year over year, unfilled orders were up 3.8%. New orders rose for a fourth consecutive month, up 2.6% to $55.4 billion in March. The transportation equipment, computer and electronic product and machinery manufacturing industries contributed the most to the increase in new orders at the national level. The history of iron manufacturing in Canada began in 1730 with the establishment of forges and a small metal working industry on the Saint-Maurice river, north of Trois-Rivières, Quebec. Steel manufacturing in Canada began in the 1880s, following the invention of the Bessemer Process in 1856. The majority of iron produced was used in steel manufacturing. The quantity of steel ingots and castings produced is one way of measuring steel production over time. By 1917, during World War One, historic data suggest production of steel ingots and castings had reached 1.7 million short tons per year. In 1939, at the start of World War Two, production was 1.6 million short tons, similar to the 1917 level. By 1944, however, production had almost doubled to 3.0 million short tons on account of the war effort. During the subsequent decades, production of steel continued to increase, reaching 14.3 million short tons by 1975. Canada currently produces about 13 million tonnes (or 14 million short tons) of steel every year according to the Canadian Steel Producers Association. The iron and steel mills and ferro-alloy manufacturing industry contributes about 2% to total manufacturing sales in Canada. Monthly data in this release are seasonally adjusted and are expressed in current dollars unless otherwise specified. For information on seasonal adjustment, see Seasonally adjusted data – Frequently asked questions. For information on trend-cycle data, see Trend-cycle estimates – Frequently asked questions. 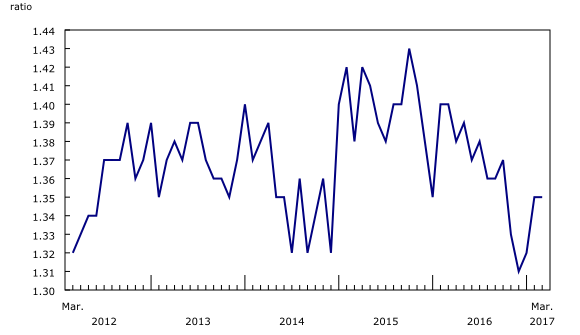 With this release, the Monthly Survey of Manufacturing has published real (price deflated) sales of goods manufactured for the principal manufacturing industries. The industry-level data are now available on CANSIM table 377-0009 for reference months January 2007 to March 2017. Non-durable goods industries include food, beverage and tobacco products, textile mills, textile product mills, clothing, leather and allied products, paper, printing and related support activities, petroleum and coal products, chemicals, and plastics and rubber products. Durable goods industries include wood products, non-metallic mineral products, primary metals, fabricated metal products, machinery, computer and electronic products, electrical equipment, appliances and components, transportation equipment, furniture and related products, and miscellaneous manufacturing. For the aerospace and shipbuilding industries, the value of production is used instead of the value of sales of goods manufactured. The value of production is calculated by adjusting monthly sales of goods manufactured by the monthly change in inventories of goods in process and finished products manufactured. The value of production is used because of the extended period of time that it normally takes to manufacture products in these industries. Unfilled orders are a stock of orders that will contribute to future sales assuming that the orders are not cancelled. New orders are those received, whether sold in the current month or not. New orders are measured as the sum of sales for the current month plus the change in unfilled orders from the previous month to the current month. Some Canadian manufacturers report sales, inventories and unfilled orders in US dollars. These data are then converted to Canadian dollars as part of the data production cycle. 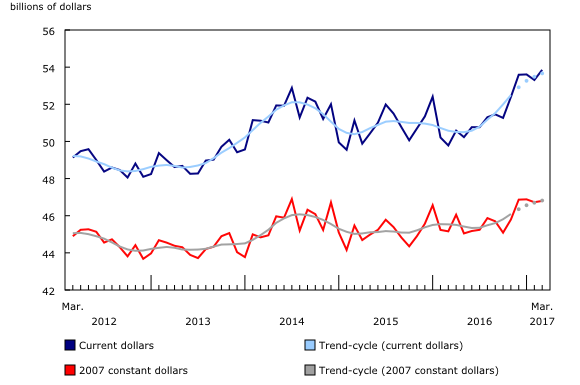 For sales, based on the assumption that they occur throughout the month, the average monthly exchange rate for the reference month (noon spot rate) established by the Bank of Canada is used for the conversion. The monthly average exchange rate is available in CANSIM table 176-0064. Inventories and unfilled orders are reported at the end of the reference period. For most respondents, the noon spot exchange rate on the last working day of the month is used for the conversion of these variables. However, some manufacturers choose to report their data as of a day other than the last day of the month. In these instances, the noon spot exchange rate on the day selected by the respondent is used. Note that because of exchange rate fluctuations, the noon spot exchange rate on the day selected by the respondent can differ from both the exchange rate on the last working day of the month and the monthly average exchange rate. Noon spot exchange rate data are available in CANSIM table 176-0067. Each month, the Monthly Survey of Manufacturing releases preliminary data for the reference month and revised data for the three previous months. Revisions are made to reflect new information provided by respondents and updates to administrative data. Once a year, a revision project is undertaken to revise multiple years of data. During annual revisions, changes are made to seasonal adjustment parameters. Real-time CANSIM tables 304-8014, 304-8015 and 377-8009 will be updated on May 29. For more information, consult the document Real-time CANSIM tables. Data from the Monthly Survey of Manufacturing for April will be released on June 15. For more information, contact us (toll-free 1-800-263-1136; 514-283-8300; STATCAN.infostats-infostats.STATCAN@canada.ca) or Media Relations (613-951-4636; STATCAN.mediahotline-ligneinfomedias.STATCAN@canada.ca). To enquire about the concepts, methods or data quality of this release, contact Bechir Oueriemmi (613-951-7938; bechir.oueriemmi@canada.ca) or Michael Schimpf (613-863-4480; michael.schimpf@canada.ca), Manufacturing and Wholesale Trade Division.